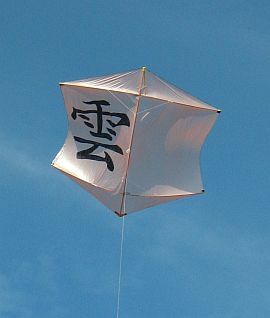 An MBK Rokkaku kite of every type, featured in Flight Reports. An MBK Rokkaku kite in just about any size is fairly easy to build, but returns more exciting flying than the same size Diamond. Just like light-wind Deltas, Roks have a tendency to fly straight overhead whenever there is rising air in the vicinity. 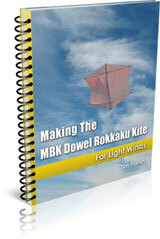 Making The MBK Dowel Rokkaku Kite is a handy e-book of printable step-by-step instructions. It's a PDF file download. Our Dowel Rok has returned many satisfying flights, often in very light air near the end of the day. The kite is also stable enough to cope with rough air in the middle of a hot day, soaring around hundreds of feet up at steep line angles. Yes it's another flirt with danger over the rooftop - this time with the Dowel Rokkaku. A few short and scary flights later, I was pulling the kite out of one of our small trees. No great drama there. A few small pin-pricks from the rose bushes on yet another flight. But eventually, as the sun dipped towards the horizon, the air settled down. With more constant wind speed, and lower strengths overall, I gradually put the big pale-orange Rok up higher and higher over our roof. Maybe out to 25 meters (80 feet) or so. A couple of trimming changes with the bridle knots also helped to keep it flying straight and true. With dark rain clouds in the not-so-far distance, the big Chinese character on the kite was appropriate - 'rain'. The Dowel Rokkaku kite eventually tired of trying to stay airborne and slowly descended towards the roof. Just like when the Dowel Delta went up a few days ago. A little line handling ensured that the Rok made it over the gutter. Whereupon it floated onto its face and proceeded to glide straight towards me like a paper plane. An easy catch in one hand!